Three species of Alternaria cause serious damage to brassicas: Alternaria brassicicola, A. brassicae, and A. raphani. Alternaria brassicicola and A. brassicae infect broccoli, Brussels sprouts, cabbage, cauliflower, Chinese cabbage, kohlrabi, kale, rutabaga, and turnip. 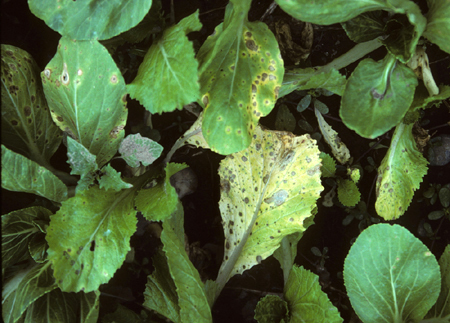 A. raphani is most often found on radish, but can infect other brassica crops. The most common symptom of Alternaria diseases is yellow, dark brown to black circular leaf spots with target like, concentric rings. Lesion centers may fall out, giving the leaf spots a shot-hole appearance. Individual spots coalesce into large necrotic areas and leaf drop can occur. Lesions can occur on petioles, stems, flowers, flower pedicels, and seed pods. Alternaria species are simple parasites that survive saprophytically outside the host. Diseased crop debris is the primary site of survival from year to year. Resting spores (chlamydospores, microsclerotia) have been reported. The diseases are favored by warm temperatures (60-78° F) and at least 12 hours of relative humidity of 90 % or more. The fungi sporulate profusely and are spread throughout fields by wind, splashing water, equipment, and workers. The main means of introduction into new areas is on infested seed. Alternaria infection can be mainly cosmetic, but results in crop rejection by distributors and customers. Infection of broccoli and cauliflower heads can lead to complete deterioration of the heads and result in total loss of marketability. 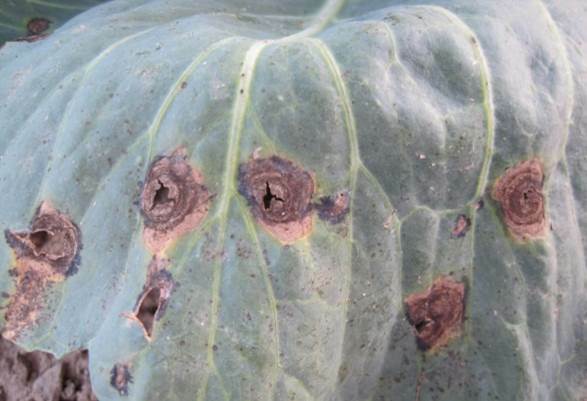 Affected cabbage do not store well as lesions provide entry for secondary soft-rotting organisms. 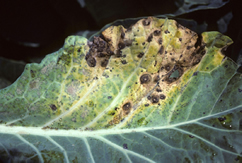 Control of Alternaria leaf spot on cabbage heads in the field is necessary for long-term storage. Heavy infections of foliage reduce plant vigor and yield. Pod infections cause distortion, premature shattering, and shriveled, diseased seed that germinates poorly. Buy seed certified as disease-free or treat seed with hot water. Practice long rotations with non-cruciferous crops. Incorporate diseased plant debris into the soil. Minimize the length of leaf wetness periods by reducing plant density, orienting rows with prevailing winds, and irrigating in the morning when leaves can dry quickly. Avoid overhead irrigation during head development. Keep seedbeds disease-free to prevent the spread of disease and locate seedbeds so as to avoid wind-borne inoculum.